Why combine the Kano Computer with Snap circuits? The Kano Computer is recommended for ages 7 and older and Snap Circuits are recommended for ages 8 and older. So, a seven year old can learn to build and program the Kano Computer and when they reach age eight they can start learning how to connect the Kano to external electronic circuits and control these circuits with software they write on the Kano. Science isn’t a spectator sport—you actually have to do science. Makers/DIYers/hackers prefer not to read about a device or watch others build their contraptions—they prefer to roll up their sleeves and build their own. The Raspberry Pi is a popular computer among the Maker/Do-It-Yourself/Hobbyist communities because it can be used to control external devices such motors and get input from sensors such as an ultrasonic range sensor (for instance building a robot with the Raspberry Pi as its brain). I decided to try something vastly simpler: flash a Light Emitting Diode (LED). While I had the Kano Computer disconnected from power, I opened the case and connected a Hard Disk Drive indicator LED from an old computer to pin 9 (Ground) and pin 11 (GPIO17) on the Raspberry Pi. I cut away the LED housing and spliced a red and black Snap Circuits Jumper Wires to connect to my Snap Circuits LED circuit. The Kano Computer comes with Scratch already installed. I connected the power to the Kano and booted it to the Kano OS desktop. To get to Scratch, use the touch pad on the Kano keyboard to point the mouse cursor at Apps. On the code tab scroll down and click Scratch. To flash an LED, you’ll use a special variable in Scratch called “MotorA”. 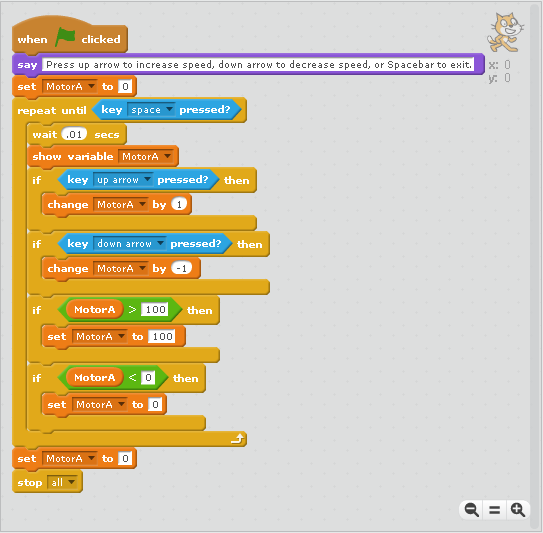 Scratch automatically handles all of the programming for MotorA to produce a “pulse width modulation” (PWM) signal on Pin 11 of the Raspberry Pi. For a primer on pulse width modulation, see this article. I’ll show you how to write a simple program to increase and decrease the flashing of an LED by pressing keys on the Kano keyboard. On the Kano, open Scratch and click on Variables (on the web version click on Data). 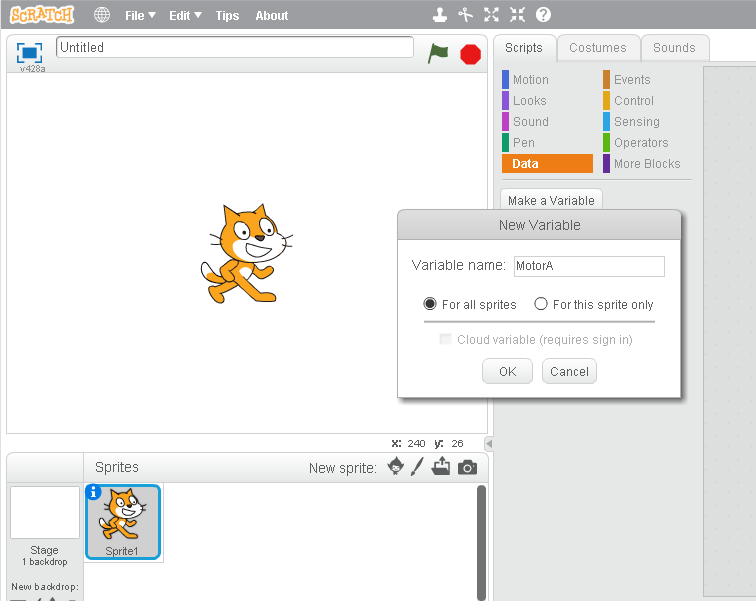 Click on the “Make a Variable” button and type “MotorA” in the textbox. Click the “OK” button and Scratch will create all the motor control variables for you. I clicked the green flag (the icon that starts the program) and…nothing happened. 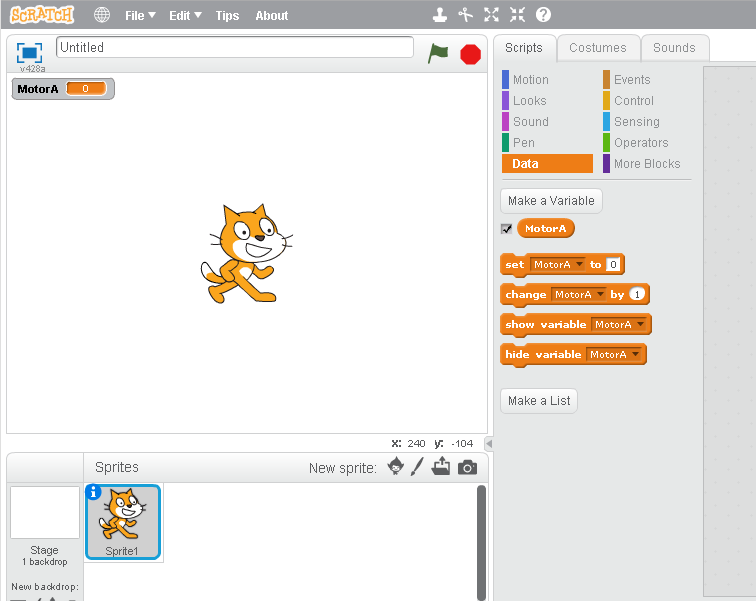 The preinstalled version Scratch is not configured to access the Raspberry Pi GPIO (General Purpose Input/Output) pins on the Kano Computer. The Raspberry Pi has been around for a while and there are many resources to help solve most of the problems you may encounter. For example, I was able to find this document that shows you how to install an improved version of Scratch. I didn’t have the Kano connected to wifi so I had to use an old skool method of getting a file from one computer to another called Sneakernet. I removed the Micro SD memory card from SD adapter in the Kano, inserted it into a USB Micro SD reader, walked over to my laptop (in my sneakers—hence the name “Sneakernet”), and inserted the reader into a USB port. Even though the Kano memory card is Linux, the Kano “/boot” directory did show up on my Windows laptop as my USB drive. Go to https://github.com/cymplecy/scratch_gpio/blob/V5/install_scratchgpio5.sh and click the “Raw” button to download the “install_scratchgpio5.sh” file (in Chrome it’ll save to your “Downloads” directory). Copy the file from your “Downloads” directory to the Kano Micro SD card. Return the Kano memory card to the Kano Computer and plug the Kano into the power outlet to boot it up. I had to use the Linux “bash” command to run the install_scratchgpio5.sh shell script. To use bash I opened LXTerminal. In the Apps window, scroll down to Terminal and click it to open LXTerminal. LXTerminal is the Raspbian “terminal emulator,” which is really just a text based way of operating your computer like you may have used on old-timey CRT (Cathode Ray Tube) computers. It installed scratchgpio5.sh and some other goodies. To run scratchgpio5 I typed “sudo /bin/bash /home/pi/scratchgpio5/scratchgpio5.sh” and Scratch opened up (it looked identical to the original Scratch program). I recreated the program above, clicked the green flag (the icon that starts the program) and the LED flashed on and then off again.